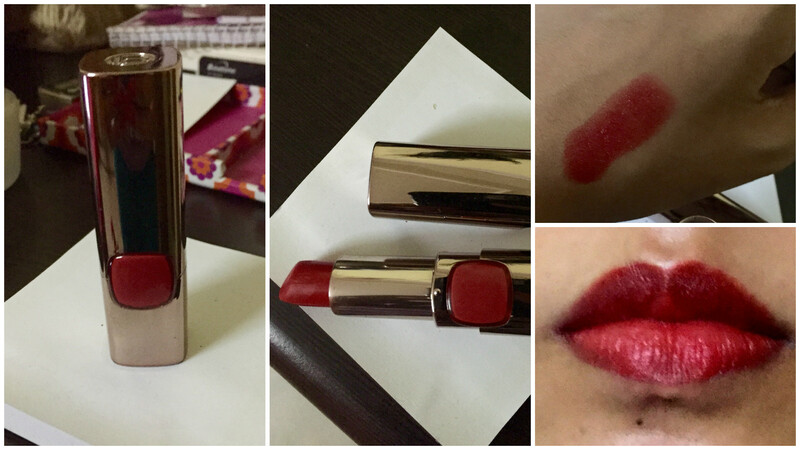 Today I am about to review one of my favourite lipsticks by L’Oreal. It’s a beautiful red shade that I personally think no one can go wrong with. It’s the Flaming Kiss shade from the L’Oreal Paris Color Riche Moist Matte Lipstick collection. According to the L’Oreal Paris team, this range of lipsticks contains “pure pigments” which deliver intense colour for 6 hours. Jojoba oil nourishes the lips and keeps them hydrated. In my opinion, the lipstick lives up to these claims, leaving me a very satisfied L’Oreal fan. Now, coming to the product itself, this is my experience with Flaming Kiss. Shade: A deep red which is distinct from both blood red shades and maroon, this will suit all – be it light, medium or dark complexion. I have a wheatish skin tone and the shade brightens up my face in no time. I love it because on days that I don’t feel like putting in any effort, I simply slap on this lipstick and don’t have to worry about my blah-outfit and lack of makeup anymore; I look better instantly! Texture and Moisturization: This lipstick has a soft texture which glides on easily without tugging. It has a very light feel; I don’t realize I have anything on at all. Even with regard to the moisturization, Flaming Kiss is absolutely perfect. I don’t need to use lip balm under it since the lipstick itself keeps my lips soft and supple. Pigmentation: The colour is intense by itself and for people who like to keep it subtle, one swipe will be enough. I usually do use two swipes on both the upper and lower lip, but that is to lock in the colour (I use translucent powder after first swipe and then reapply). Staying Power: The lipstick sets on my lips in about 10-15 minutes. After that, it does not transfer onto my hands or anything light that touches my lips. If I do not eat, it usually remains the same intense shade for 4-5 hours easily. If I eat after application, my lips do lose colour but they are not completely washed out – it still seems like I have a light lip tint on. This is a great lipstick for those who like their lips to pop and do not want the hassle of reapplication and touch-ups. The best part is, it actually nourishes my lips so that after application, they have better texture than before! The only thing is, L’Oreal Flaming Kiss does not come cheap. But I don’t mind investing a little more in shades that I use often, so it works for me. In short, I really love this lipstick and use it frequently, with casual, formal and (often) party outfits. So if you want some colour in your life and on your lips, and a luscious red at that, L’Oreal Paris Color Riche Moist Matte Lipstick Flaming Kiss will be perfect for you!